A continuing education course for personal trainers, group exercise instructors, and health/fitness professionals working with pregnant and postpartum women. Manual and test accessed online. PLEASE NOTE: You will receive an email within six hours after your purchase is processed with information on your key code for online order access. Includes print manual and test, with the option to take the test online. PLEASE NOTE: You will receive an email within six hours after your purchase is processed with information on your shipment tracking for a print order. 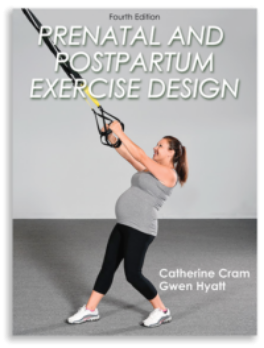 Discover what every fitness professional working with pre- and postnatal women should know about designing safe and appropriate exercise routines with the Prenatal and Postpartum Exercise Design, Fourth Edition CE Course. Learn the effect of exercise on maternal and fetal health and how to set intensity levels and modify exercise based on guidelines from the American Congress of Obstetricians and Gynecologists (ACOG), the Royal College of Obstetricians and Gynaecologists (RCOG), and the Society of Obstetricians and Gynaecologists of Canada (SOCG). This course covers the latest research; demonstrates appropriate core strengthening and pelvic floor exercises; and includes suspended bodyweight, flexibility, relaxation and breathing exercises. It also suggests guidelines for strength training, water exercise and competitive sports during pregnancy. This self-guided course allows you to work at your own pace and explore the material through a comprehensive text and study guide, finishing with a 55-question exam composed of multiple-choice and true-or-false questions (test may be taken online with either format or mailed/faxed with print format). Certificate and CEs are provided at completion and passing of test. Identify the current research and the effects of exercise on maternal and fetal health. Describe anatomical and physiological changes that occur during pregnancy. Discuss the current American College of Obstetricians and Gynecologists (ACOG) and international guidelines for exercise during pregnancy and postpartum. Outline safe and appropriate exercise design for prenatal and postpartum women and discuss considerations for training during pregnancy and postpartum. Identify specific and appropriate exercises and activities for prenatal and postpartum women. Explain the benefits and guidelines of water exercises for pregnant clients. Outline suggestions for initiating or enhancing a prenatal and postpartum exercise program. Identify postnatal exercise goals and program design considerations for recover from both vaginal birth and cesarean delivery. Identify complications and common conditions of pregnancy and postpartum and management strategies. Discuss fitness practitioners’ professional responsibilities, including health screening, monitoring exercise, record keeping, and emergency procedures. Identify available resources that can be used in prenatal and postpartum exercise instruction and programming. *Course certificate and continuing education credits provided through Human Kinetics following passing of home study written exam. may be applied towards recertification as an LCCE educator under the learning competencies 1 – 3.